Paste Magazine: Eight Pumpkin Ales Ranked | Oh Sarah O ! New Belgium Kick is very good although the pumpkin taste is a bit subtle compared to the cranberry. I like Shipyard Pumpkinhead a lot because it tastes like pumpkin pie (very spicy). I think number one for overall pumpkin is the Elysian Night Owl. Update: Last week I visited the Wichita Brewing Company which had a seasonal Pumpkin Ale on tap that was really good! 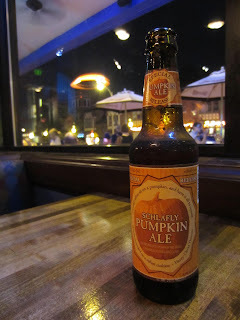 I think it was the closest in comparison to Schlafly's Pumpkin Ale to date. I wish they would bottle it so that I could hoard them in my freezer.